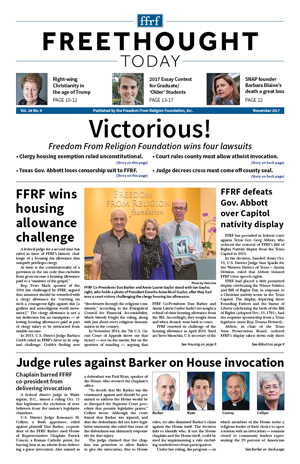 We will be delighted to mail (or email) you information about the Freedom From Religion Foundation, including a brochure and a complimentary issue of Freethought Today, FFRF's newspaper. FFRF is a national membership organization of freethinkers (atheists and agnostics) working to keep state and church separate. FFRF is a 501(c)(3) nonprofit — all dues and donations are deductible for income tax purposes. If you do not live in the U.S., we will gladly email you a free information packet. Or fill out the form below to get better acquainted. We hope after looking over our website and materials that you will join FFRF in our vital work. FFRF protects your confidentiality and will not divulge, share or sell your contact information. I do not wish to receive the newspaper. An account is optional, but it will allow you to update your contact information, communication preferences and keep track of your donation history. We suggest using your email address as a login name. Your password must be at least eight characters long, and contain at least one number.